Image: the town Velburg in winter, with the typical landscape of the Frankian Jura. Open: APR to OCT daily 9-17, last tour 16:15. In winter groups (20+) after appointment. Fee: Adults EUR 2.60, Children (5-14) EUR 1.60, Children (0-4) free. Groups (20+): Adults EUR 2.30, Children (5-14) EUR 1.30. Guided tours: D=30min, V=23,000/a . 30-SEP-1895 discovery and first exploration. 02-DEC-1972 discovery of the Adventhall on the first Advent. 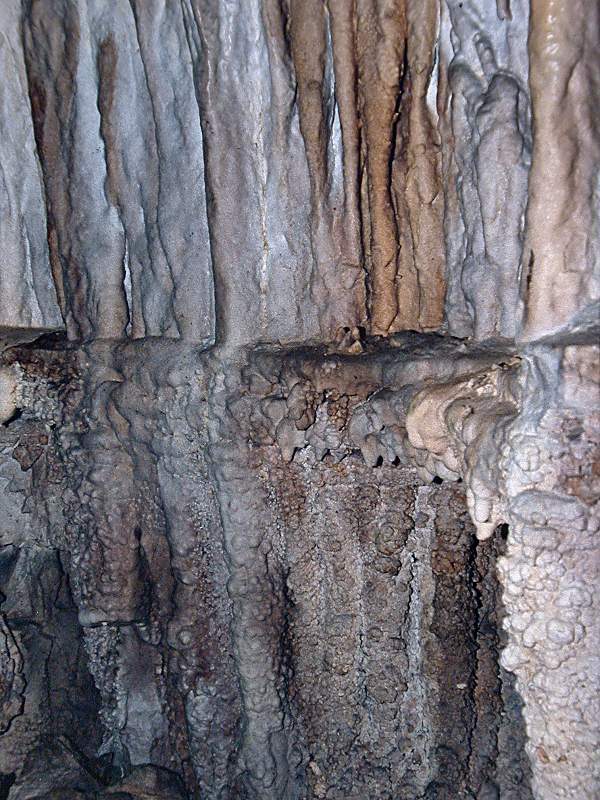 The König-Otto-Tropfsteinhöhle (King Otto dripstone cave) is located near Velburg in the Oberpfalz, on the Fränkische Alb plateau (Frankian Jura). The plateau is hilly, some of the hills have dolomite rocks on top, which were often used to build castles. The hills are the remains of petrified reefs, which resist weathering better than sedimentary limestone. 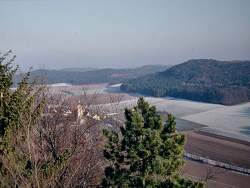 Also this hills are much less fertile, so they are used for forestry. Towns and agriculture take place in the valleys and plains in between. Inside such a forest covered hill, close to the town St. Colomann is the location of the König-Otto-Tropfsteinhöhle. 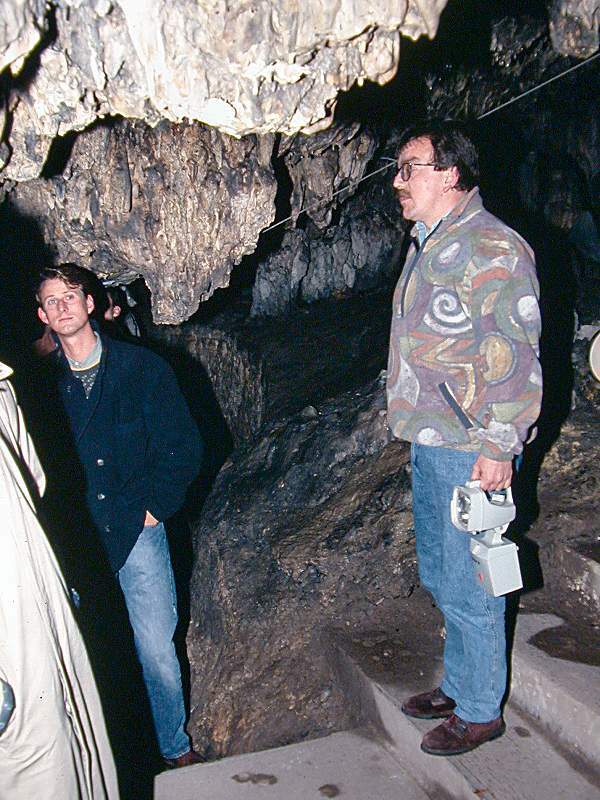 The cave was named after the bavarian King Otto I., as it was discovered on his saint's day, the 30-SEP-1895. The story goes, that the shepherd Peter Federl hunted a fox. When this fox disappeared inside the hillside, he followed him and entered the cave. The legend does not tell much details, but it seems the entrance already existed, although it was probably never noticed. 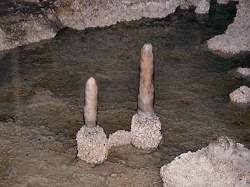 Image: two rare stalagmites with calcite crusts at the foot. 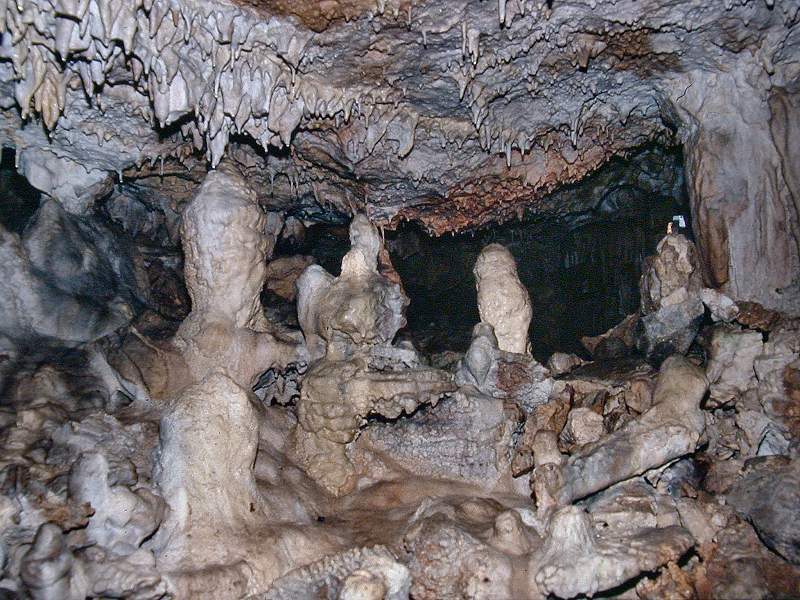 The new discovered cave was developed immediately and opened to visitors. The works included the construction of paths and the widening of narrow passages. Also, as typical for this area, some speleothems were crashed to make way for the path. After this works, the cave was visited using candles, torches and magnesia. Unfortunately all those light sources produce a decent amount of grime, which covered the whole cave including the speleothems. This part of the cave is today black and unappealing. But this gives an impressive contrast to the 1972 new discovered Adventhalle (Advent Chamber). It was named after its discovery on the first Advent. 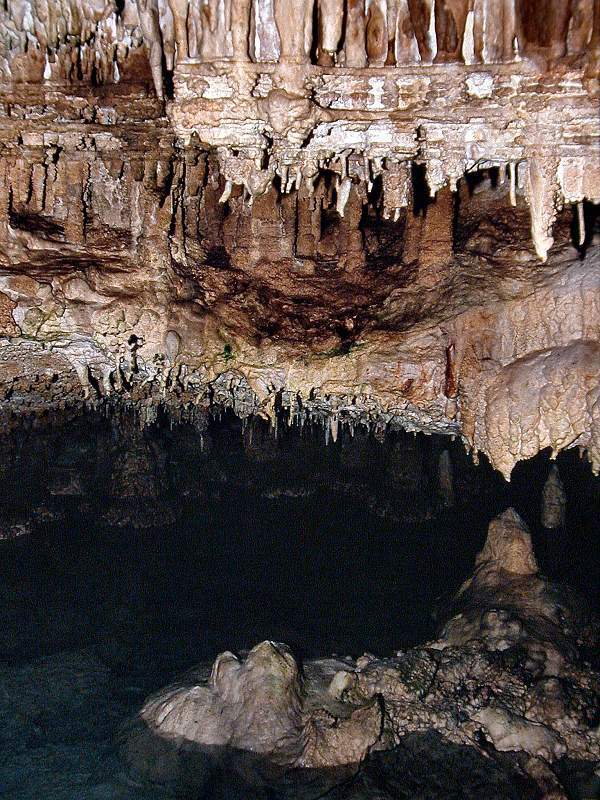 The special feature of this chamber are its speleothems, among them dogtooth spars, cave pearls and even some helictites. In contrary to most other cave discoveries, this one was not by accident. 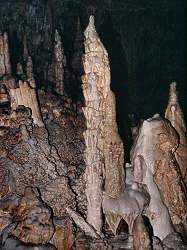 This new parts was systematically sought after by Helmut Schlierf and Michael Kirnberger from Fürth, two members of the Nuremberg caving club Forschungsgruppe Höhle und Karst Franken. They explored the cave very intensive and then dug at the most promising places, at a time when this tactic was generally unknown in Germany. The new chamber is extraordinary. It was covered by a cave lake for a very long time, and the water deposited calcite crusts all over. In opposition to dripstones with rather smooth surface, this calcite is formed of single growing crystals which are also called dogtooth spars. At the surface of the water the amount of deposited calcite is pretty high. 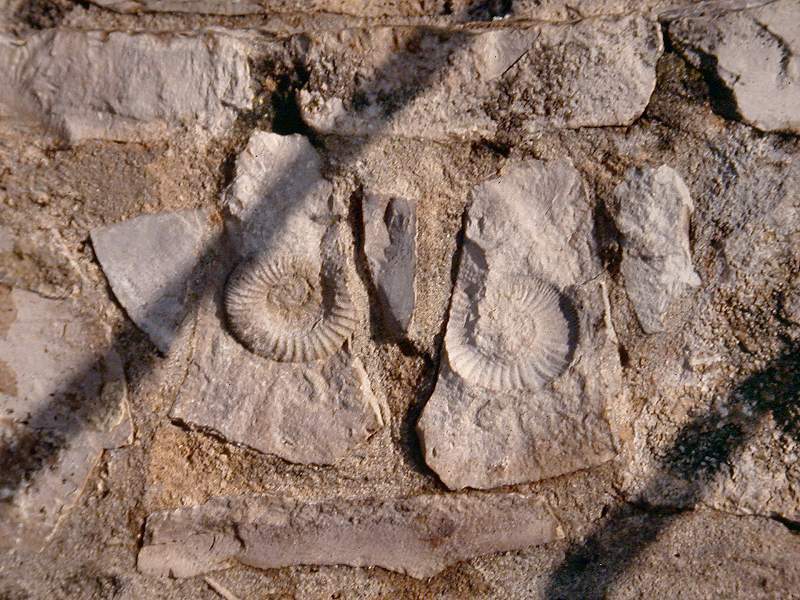 This results in so called water level marks, horizontal deposits of limestone marking the former water level. Stalagmites which grew on dry ground and then get partly covered by a cave lake get a certain look: they are covered by calcite crystals at the foot. Search Google for "König Otto Höhle"